Richard Muti - Reports from a native son. 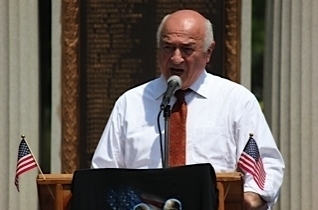 Mayor Richard Muti addresses Ramsey residents in Veterans Park on Memorial Day, 2012. Reports from a native son. Orthodox Jews from Rockland County, New York, have been venturing into northwestern Bergen County towns – most notably, Mahwah and Ramsey – not to take up residence (at least not yet), but to use local taxpayer-supported parks and recreational facilities and to set up outdoor zones (eruvs) where members of their sect can avoid its strict prohibitions on Sabbath activities. Opposition to this intrusion has been met with accusations of anti-Semitism, by lawyers representing the Orthodox community and, most recently, by the editorial page editor of The Record, Alfred P. Doblin. Mr. Doblin calls attempts to exclude out-of-staters from local parks and to block the establishment of eruvs within Mahwah "a civil and a moral crime." To be blunt, he adds, "[t]he people who say they don't want THOSE people are bigots, and in this case, also anti-Semite. If you don't want Jews living in your neighborhood, you're an anti-Semite. It is what it is by definition." Mr. Doblin fails, I think, to give adequate weight to a legitimate and not irrational concern of residents. We've seen what has happened in Rockland County and in Lakewood, New Jersey, where large settlements of Orthodox Jews, who constitute a monolithic voting bloc, have taken control of local government and school systems, to the detriment of public education. And we don't want that to happen to our communities. Frankly, towns like Ramsey and Mahwah were no different from the rest of society in the early part of the 20th century, when not only anti-Semitism, but anti-Catholicism, anti-foreigner and anti-everyone with a darker skin tone were prevailing sentiments. My two southern Italian grandparents – illiterate and poor, as well as dark-skinned – settled in Ramsey in 1911, when only a handful of Jews and Italians lived there. My father distinctly remembered watching, as a nine- or ten-year-old, a Ku Klux Klan parade down our Main Street. Who knows which Ramsey government leaders were proudly marching through the center of town under cover of their white hoods and sheets? My father's age would have put the event in 1922 or 1923, a time when the Klan was resurgent in the nation and gaining a foothold in northern states like New Jersey. But Ramsey has evolved, just as the nation has, despite the horrible occurrence in Charlottesville, Virginia, and the disgusting response to that outrage by our president. Those deed restrictions at the RGCC are gone, and blacks and Jews have served on that club's board of directors and, indeed, as president of the club. My father grew up to become a prominent businessman in Ramsey, president of the Chamber of Commerce, president of the Republican Club, and president of the Borough Council. That same Jewish sixth-grade teacher later became superintendent of Ramsey public schools. On a recent Sunday, I stopped by Finch Park, Ramsey's large recreational complex. A half-dozen New York-licensed cars were parked in the lot adjoining the children's playground, and I could see kids cavorting in the sandbox and on the swings and other paraphernalia, under the watchful eyes of their parents. Six of the seven ball fields at Finch lay unused in the afternoon sun. On the one field in use, a father, dressed in traditional Orthodox clothing, pitched batting practice to his 10- or 11-year-old son – a vision of the great American pastime in microcosm. The scene reminded me of Chaim Potok's great book, The Chosen, set in late 1940s Brooklyn. An anti-Zionist Hasidic sect was at odds with more secular Jews, who favored a free Jewish state in the Middle East. The warring factions were brought together by the two sons of their respective leaders, sons who met on a ball field. Personally, I don't mind if Orthodox Jewish families from Rockland County take an afternoon's worth of recreation in Ramsey, so long as Ramsey residents are not deprived of access because of overcrowding. But I won't stand still for one minute if I see a threat to my hometown or the school system that educated my father and me and dozens of my family members. Our community is not bigoted and not anti-Semitic, just as Mahwah and other communities facing this dilemma are not bigoted and not anti-Semitic. And we resent being labeled as such. Congressman Steve King, R-Iowa, an outspoken opponent of immigration, whether legal or illegal, has a new catchphrase to match his "calves the size of cantaloupes" comment of 2013. Back then, his purpose was to denigrate high-achieving Mexican "dreamers," brought here illegally as children, by suggesting that for every success story, there were a hundred others about young migrants with superior leg strength – the product of having hauled 75-pound bales of marijuana across our southern border. Steve King's latest riposte in the immigration debate comes with a warning to those who would take Emma Lazarus's immortal poem, "The New Colossus," to heart, especially as it may apply to refugees from Syria and other war-torn countries of the Middle East. We must close our doors to those huddled masses yearning to breathe free, the Iowa congressman would argue, especially if their skin tones, or perhaps even their religious beliefs, are shades different from what he regards as acceptable. "We can't rebuild American culture," Mr. King recently tweeted, "with somebody else's babies." Other lawmakers have taken a different approach to limiting immigration, one based on more politically correct criteria than the blatant racism of Steve King. Sen. Tom Cotton, R-Arkansas, has co-sponsored a bill that would restrict legal immigration to well-educated foreigners with technical skills and fluent English. By whatever standard these mostly Republican officeholders apply, my family would have been left in the cold, or, rather, in the heat and wretched poverty of Southern Italy at the turn of the last century, when all four of my grandparents – young pioneers as intrepid as the pioneers who settled the American West – left home and family to seek a better life. None of them spoke English. Just one, my maternal grandmother, could read and write her native language; the rest were illiterate. America was welcoming then, before the Age of Technology, when the strong backs and callused hands of cheap labor were needed. According to Ellis Island records, Giuseppe Milana, my maternal grandfather, was the richest of the four; he had fifty bucks in his pocket when he arrived and made his way to Waldwick, where many of his paisani had congregated. He got a job as a laborer with the Erie Railroad. Later, he started his own landscaping and nursery business, putting to use skills he'd learned in the Old Country, to support his wife and eight children. On the ship's manifest for Sergio Muti, my paternal grandfather, someone had initially written "$10" in the column describing his finances, but that number was crossed out, and a zero put in its place. He came with nothing, but found work as a longshoreman on the Hoboken and Brooklyn docks before moving to Ramsey in 1911, where he wielded a pick and shovel to help pave Franklin Turnpike, then a dirt road. Years later, he cut himself on a rusty tool while digging out manmade Crestwood Lake in Allendale. There were no health benefits for immigrant laborers in 1928 and no workers compensation, so he didn't see a doctor until the tetanus he'd contracted was too far gone. He died a painful death at 43, leaving a wife and nine children. The next generation of my family had an easier time. They were small business owners, stone masons, waiters and waitresses, telephone operators, barbers, mailmen and the like – in other words, working- and middle-class Americans, the base constituency whose support both political parties crave. It took the third generation, of which I am a member, and the fourth generation for many of us to attend college and become medical and legal professionals, cops, teachers, and larger business owners. My own family's story is remarkable only because it mirrors the stories of millions of other American families with roots in the great waves of immigrant poor people who swept into the United States to escape potato famine in Ireland in the 1840s, political upheavals in mainland Europe in the mid- to late 19th century, pogroms in Eastern Europe and Russia during the Czarist era, and, yes, poverty in Southern Italy – the circumstance that informs my unabashedly liberal point of view on immigration. Prejudice against southern Italians was an actual policy of the United States government, which had a special classification for people like my grandparents. "Italy South" was their listed country of origin, a geographic delineation reserved for no other nationality. In 1911, when our nation was so thoroughly segregated that admitting black Africans was unthinkable, a House committee on immigration questioned whether Italians from places like Calabria and Bari, in the lower reaches of the Italian peninsula, and Sicily were even of the Caucasian race. That sentiment soon led to legal restrictions. The Immigration Act of 1924 established quotas for people from Southern and Eastern Europe, as well as other disfavored regions of the world. On average, in the two decades prior to the Act, 200,000 Italian immigrants, 85 percent of whom were from the South, entered this country each year, except during World War I. After the Act became effective and for the next two decades, that average dropped to fewer than 10,000 per year. The legislative debate that led to this law's enactment is eerily similar to the declaration made by Congressman King some 90 years later. "In all of its parts, the most basic purpose of the 1924 Immigration Act," according to the Office of the Historian, U.S. State Department, "was to preserve the ideal of U.S. homogeneity." Eleven of my uncles served during World War II. Thankfully, none of them died in that war, although the young marine who stormed the beaches of Saipan and the B-24 tail-gunner who flew more than 20 missions over France and Germany came perilously close. Those uncles are all gone now – somebody else's babies who helped preserve our American culture. One of the many things that define Ramsey is its unique downtown, anchored by the train station that has served our town, originally named "Ramsey Station," for more than a century. That structure, beautifully restored by the state during my term as mayor, at no cost to local taxpayers, also happens to be the oldest continuously-operated train station in America. Apart from aesthetics, the downtown train station is the backbone of our business district. Close it to the hundreds of commuters who use it every day and you risk shuttering dozens of local businesses that depend on those transients for a good part of their revenue. I support Mayor Dillon and the borough council in their efforts to make the downtown station and its crossing safer for everyone while, at the same time, keeping that vital link to our past, our present and our future open for business. New Jerseyans determined to dynamite the political swamp down in Washington should look closer to home for quagmires to drain – like the one just off exit 7A. In a deal that smells more like out-and-out bribery than statesman-like compromise, the Democrat-controlled legislature is about to scuttle a law that prohibits Governor Christie from cashing in on a book contract while in office, in exchange for Christie's acquiescence on increasing each legislator's office budget by $30,000. I am reminded of a scene from one of my favorite movies – "A Man for All Seasons." Richard Rich has just lied through his teeth to help convict Sir Thomas More of treason. As Rich leaves the witness stand, More, in the dock, notices a badge of office dangling from the man's belt. "Master Rich," More says, "may I inquire – what does that badge signify?" Rich responds that it is the badge of his new post as Attorney General for Wales. Sir Thomas' retort is magnificent: "It profits not a man to give up his soul for the world, Richard . . . but for Wales? For Wales?" I'll paraphrase another great movie, "Casablanca." Rick listens to Ugarte brag about he visas he helps refugees get at a cheaper price than Ferrari, his competitor. Rick replies that he doesn't object to a thief who preys on the weak and helpless. He merely objects to "a cut-rate one." Trenton politicians should go to the movies more. Is the Ramsey pool the right site for a community/senior center? Practically all those attending the June 1 public hearing in Ramsey about the proposed community/senior center approved of the idea of a new community/senior center. The only point of contention seemed to be the site the mayor and council had chosen for the facility. Many, including the chair of the Ramsey Pool Commission, felt that grafting a community/senior center onto an award-winning pool facility would detract from the enjoyment that 3,500 Ramsey citizens receive from using the pool each summer. About half the standing-room only audience on June 1 – mostly younger parents – opposed the pool site for the project and wanted assurances that the mayor and council had explored all other alternatives; the other half – mostly seniors – would brook no further delay in replacing the inadequate building seniors are now using at Finch Park. In my opinion, both sides may be right. Seniors deserve a proper setting, as do other community groups who have insufficient space for carrying out their activities. If the mayor and council did thoroughly explore other sites for the new center, they haven't made that case to the public. One citizen suggested a large, under-utilized parking lot across from Borough Hall as a potential site for the community-senior center and received no response that the governing body had even considered that location. There may be other sites. For example, we have, right in the center of town, a dirty, unsightly recycling center that occupies several acres of borough-owned land. Why not explore a potential agreement with Mahwah to jointly use its new recycling center off Franklin Turnpike and convert our existing facility into a higher and better use? This issue threatens to drive a generational wedge through the heart of our community. The mayor and council should heed the warning signs and act accordingly.